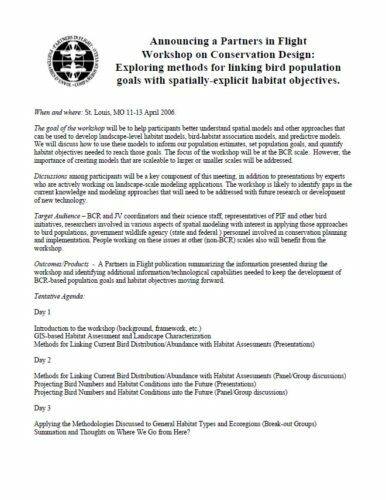 The goal of the workshop will be to help participants better understand spatial models and other approaches that can be used to develop landscape-level habitat models, bird-habitat association models, and predictive models. We will discuss how to use these models to inform our population estimates, set population goals, and quantify habitat objectives needed to reach those goals. The focus of the workshop will be at the BCR scale. However, the importance of creating models that are scaleable to larger or smaller scales will be addressed.